When you lose someone you deeply love, you want to hold onto them. A columbarium is a group of niches that contain the urns (with cremated remains) of our dearly departed. The urns are placed inside the niches, then sealed with a cover plate. These face plates are engraved with the person’s name and dates. A columbarium is a resting place in the journey of life everlasting. • Our Memorial Garden and Columbarium are a visible sign that we care for our members and their families. • Provide comfort to the family that there is a memorial to their loved one within the church. • An easy way to pre-plan and relieve the surviving family of difficult decisions. • It is theologically and economically sound, and environmentally friendly. Join your fellow members of Gloria Dei Lutheran Church in making the memorial garden and columbarium ministry a reality. 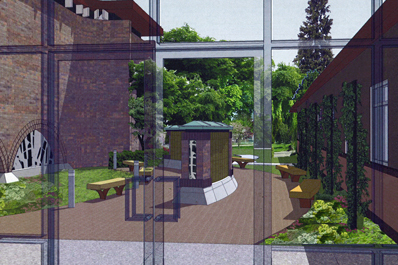 This is a great opportunity for you to purchase your niche and/or donate to the development of the columbarium. All funds to the columbarium will be used to provide secure niches for families, and to enhance and maintain this sacred space as a place of meditation and reflection. If my question isn’t asked here, who can I talk with? What is a columbarium? Why is the church planning to build one? A columbarium is a set of memorial niches in a wall or similar structure. An urn or box with a loved ones cremated ashes are placed into a niche in the wall, sealed, and covered with a plate that is engraved with the person’s name and dates. 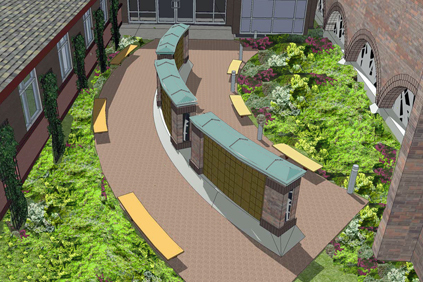 Our church is building a Memorial Garden with Columbariums because members have recognized a need for peaceful, church-based final resting place for their loved ones. The Columbarium project is a grassroots effort – it is a member-based initiative that has won the support and appreciation of the council. Why choose cremation and memorializing in a columbarium? Cremation is becoming a more common way to treat the death of a loved one. According to 2012 statistics, cremation was the preferred option in Washington for almost three out of every four deaths. Cremation is also more environmentally friendly than burial. Placing the remains in a columbarium niche requires much less space than a cemetery plot, and can be much less expensive than a traditional coffin/cemetery plot burial. Who is eligible to be inurned in the columbarium? Gloria Dei members, their families, and other persons determined to be eligible by the Columbarium Committee of the church. 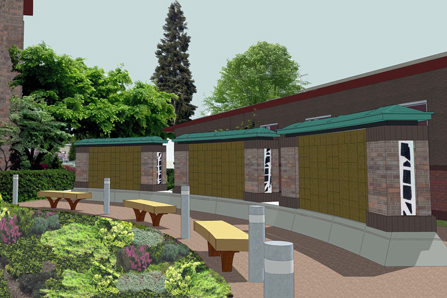 When will the Columbarium be constructed? The actual date of construction will depend upon niche sales and raising of funds, but construction is anticipated to occur in 2016. What will a Memorial Garden in our courtyard look like? Can I choose the location of my niche? Regarding niche location, you may choose any niche that is not already sold or reserved by deposit. What are the costs? Do I need to pay the full amount at one time? If you select an 8″x8″ niche, the cost is $1,800 for a single or $2,2oo for a companion purchase. If you select a 12″x12″ niche, the cost is $2,200 for a single, or $2,600 for a companion purchase. The engraving and inurnment service is included with these niche costs, but cremation, urns, and memorial/funeral service costs are the responsibility of the family. You do not need to pay the full amount at one time. You may make payments according to a multi-year schedule, but use of a niche requires payment in full prior to inurnment. Am I responsible for the maintenance? No, the Church Council and its designated Columbarium Committee will be responsible for operating and maintaining the Columbarium. If I purchase a niche will I own part of the Gloria Dei property? No, purchasing a columbarium niche is purchasing the right to use the space for yourself or your loved one. A niche purchaser will have no interest in the property, real or otherwise, of Gloria Dei. Will my columbarium deposit or funds ever be used to pay for ongoing or special church expenses? 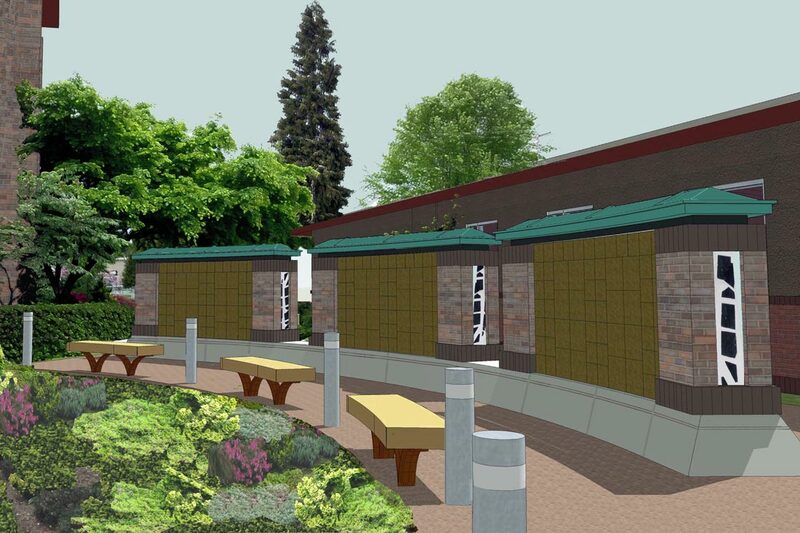 All monies, in any form, received by the church or the Columbarium Committee (through niche sales, gifts, donations, or other sources) that are designated for the Memorial Garden and Columbarium will be used for the construction, operation, maintenance and enhancement of the Columbarium. In later years after all the initial work and enhancements are completed, there may be a small surplus that could go to the Church general fund. Who’s in charge of the Columbarium? How can I be assured that decisions regarding a special place will be made thoughtfully? The Church Council (subject to the laws of Washington) exercises ultimate authority over the Columbarium. The Council will appoint a Columbarium Committee to act as the manager and arbiter of the Columbarium. Additionally, very detailed policies and procedures governing the Columbarium have been prepared to ensure that its management and oversight is responsible, thoughtful, and respectful.